Grand Tea has provided me with Chenpi Loose Black Pu-erh for the purposes of providing an honest review. I haven’t had the greatest of experiences with pu-erhs, and I’ve never had one that was aged inside of a tangerine, so I was a bit apprehensive about trying this Chenpi Loose Black Pu-erh from Grand Tea. If you’re not familiar with how dried citrus peels smell like, you’ll get a good whiff of it from this tea when you open up the package. If I had to describe it, I would say it smells quite subtle compared to a fresh orange or tangerine. You can smell that it was a tangerine, once upon a time, but it’s aromas have become subdued with time. 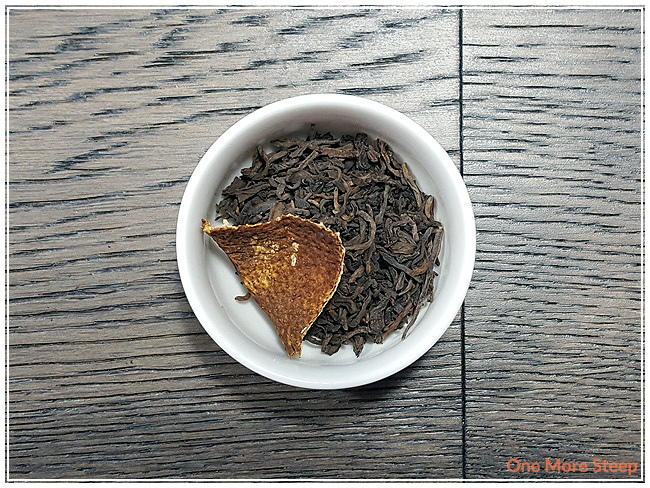 Chenpi Loose Black Pu-erh is aged pu-erh that was kept inside of a hollowed out tangerine. Each unit of tea comes with some of the peel. The peel is still supple, and you can tear it into smaller pieces to steep with the tea leaves for added flavour. Grand Tea recommends steeping in 90-100°C (194-212°F) water and to do two rinses with boiling water prior to steeping for 1 minute. The rinsing process is to remove any dirt or debris in the tea. I rinsed twice and steeped according to the instructions. 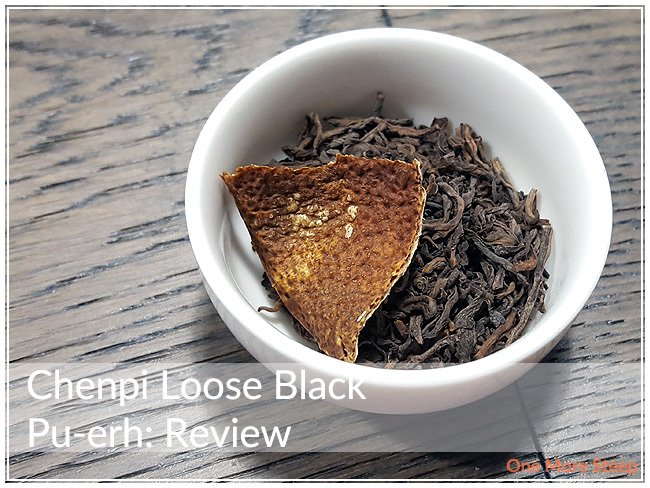 Chenpi Loose Black Pu-erh steeps to an incredibly dark amber colour, but in my tea pot it looked quite dark – nearly black – before I poured out a cup. 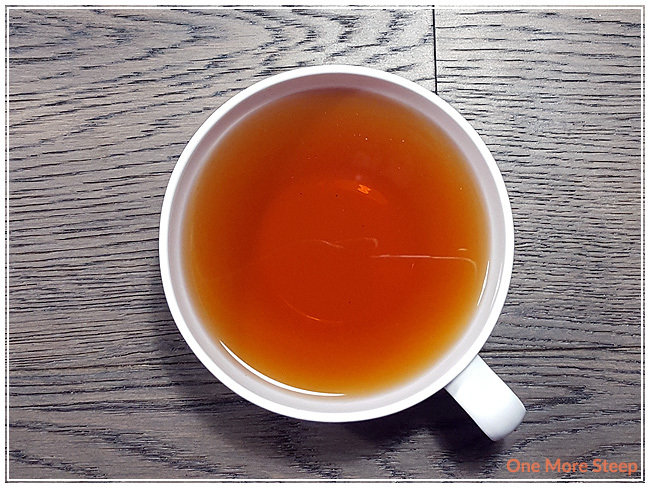 The aroma of the tea is warming and inviting – there’s the soft aroma of the tangerine/citrus, and there’s an almost woody aroma to the tea as well, which I’ll attribute to the pu-erh base. There’s some great earthy notes to this tea, which go great with the woody aroma. It has a bit of musty flavours, something that reminds me a bit of meaty mushrooms (think portobello), which all get wrapped up with a warm citrus flavour. There’s no sweetness here, it’s a completely savoury tea and it’s quite enjoyable (yes, I’m saying that about a pu-erh tea). 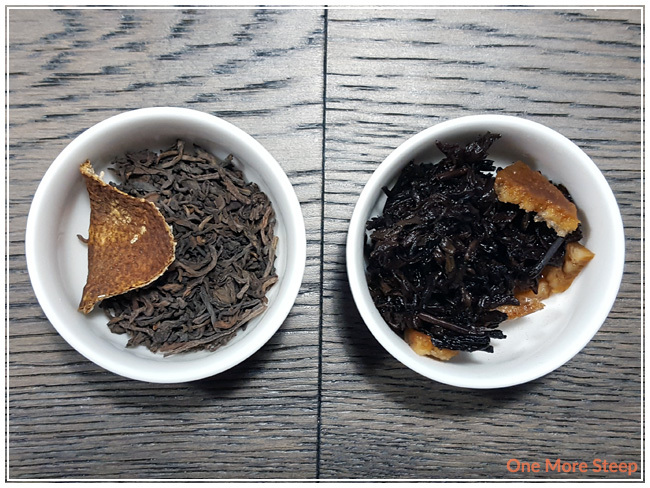 I resteeped Chenpi Loose Black Pu-erh a few times (four steeps in total), and found that the citrus/tangerine flavours were fading by the second resteep and almost completely gone by the third resteep. It still had a great warming quality to it, and it still had the rich earthy notes in the flavour. 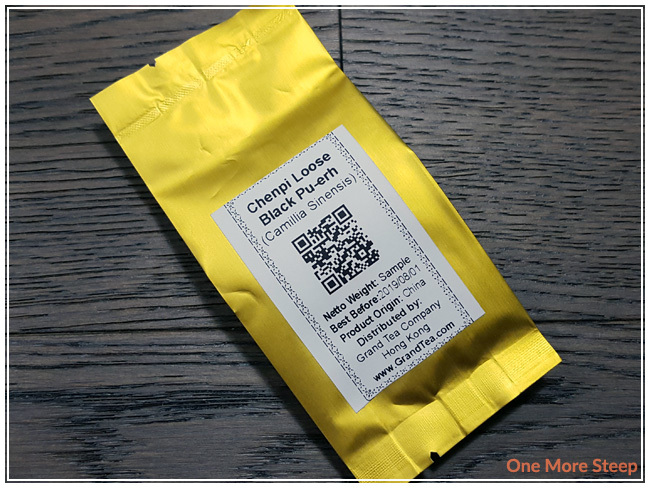 I liked Grand Tea’s Chenpi Loose Black Pu-erh. I’m still not a convert when it comes to pu-erhs, but I genuinely liked this one a lot better than the last time I tried (which was a raw pu-erh). I think the tangerine peel made a difference for me, the flavour just balanced out the earthiness of the pu-erh and led to a very well balanced cup of tea. I enjoyed the richness in this tea, it tastes quite good. I think it’d go really well with a heavy, savoury meal. There’s also this lovely warming quality about this tea that I quite enjoyed, it’s a characteristic that I find often with tea blends that have ginger or cardamom, but it was in this one as well and it was nice on the palate.